And where, pray-tell, are they going to grow all this switchgrass? Also, how are they going to keep that level of production up without destroying the soil? I really hate it when EROEI creates a false benchmark, when the discussion should really be about Greenhouse emissions reductions. The "Greenhouse oppourtunity cost" of biofuels is far too high. The entire argument for the use of switchgrass has always been that it is a non-food crop and it can be grown on non-farm land. By using switchgrass for fuel, we can use corn and beans solely for food. "Now, we really need to use an Extension effort to let farmers know about this new crop," said Ken Vogel, U.S. Department of Agriculture geneticist. Mr. Vogel wants to tell farmers about this new crop. And as soon as they know about it, do you think anyone is going to choose to grow corn or beans? Forget the “low quality acreage” idea. The fertile farms of the midwest will quickly abandon corn and beans for the new easy-to-grow, strong-cash-flow crop. Guess how much tortillas will cost then. The debate should not be about AGW. AGW is only one of many environmental issues. A very minor one at that. EROEI is a good benchmark for ghg and also the usefulness of biomass as a transportation fuels. The reason I am negative about PHEV, wind, and solar is that there is huge environmental impact. The only benefit is a slight reduction in ghg assuming these technologies work as advertised. Still waiting for that to happen. The reason I am very positive about biomass to energy is that there many huge environmental benefits like restoring top soil and reducing wind and water erosion. GreyFlcn and Danzig flunked geography because they do not know sugar cane is not grown in North Dakota nor are tortillas a staple. "Also, how are they going to keep that level of production up without destroying the soil? Since the author for your Peak Soil" article appears very against biofuels in general, I find it odd that one of her suggested actions is to continue funding research for cellulosic ethanol. Isn't this what this Switchgrass study is all about? I live by a simple rule: equivalent exchange. It is impossible to get more or less energy out of something than is in it. I realize part of that energy comes from the sun, but part of it also comes from the earth and the air. Remember, whatever that plant grew from, it had to come from somewhere. It may have '5x' its production cost from the standpoint of 'we only used 1/5 of its energy content to harvest and refine it', but that doesn't even come close to factoring in everything. By that logic, solar pv has a million times more energy than it takes to install and manufacture it. What we need is not something else to burn, but a fuel that doesn't burn. Until then, engines are still only 15-30% efficient, and until we start using something that is 80-90 percent (like perhaps a fuel cell or some other electrical source with a motor), we can't start bragging about how one burns cleaner than the other. Rubbing alcohol burns clean too, but most people aren't putting it in their engines. josh, I think you've been watching too much Anime. 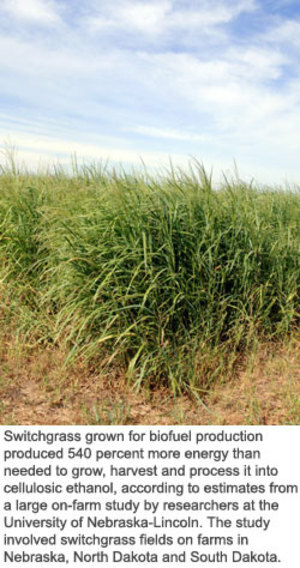 Switchgrass can be grown as part of a mixture of prairie plants. Grown in this way, very little fertilizer or irrigation is needed. One or more of the plants can be a nitrogen fixer, thereby reducing fertilizer inputs after the first year. As a bonus, the root systems of these plants sequester atmospheric carbon into the soil, improving soil fertility and reducing erosion. Given the rising demand for grain from countries like China and India, I sincerely doubt that switchgrass will supplant staple grain production. In fact, prairie "grass" mixtures can improve the fertility of marginal land rather than exhausting it. The end result would be more arable farm land, not less. Finally, when did it become the responsibility of the U.S. to feed the world all by itself? Can't other countries produce grain for export? Saudi Arabia doesn't provide all the oil for the world... why is the United States expected to provide all the world's grain? how productive that is in biofuel though I don't know, nor whether we will actually use a good and sustainable system, or whether we will produce corn using more and more fertilisers and at vast energy cost. Dave, here's a link to an article about a company called Range Fuels. They've developed a modular and portable pyrolysis system that can turn wood chips, grasses, ag waste, etc into biofuels. The portability aspect might allow regional and local production of ethanol, reducing the distances involved in distribution. Of course, Butanol would be better, but until then... Luckily, the two stage process used by this system should be amenable to producing other biofuels at a later date, with some modifications. That's what we need to see more of.